As part of the Mary River Festive spirit, we kick off at "Heatherview" Wilcox Rd, Kybong for an afternoon of fun by the beautiful Mary River on 7th November 1pm to 8pm. .Come join us for an afternoon of activities including tree planting, swimming, canoeing (bring your canoe), games, music.and food. Bring a chair and sunscreen. Entry by gold coin donation. Invitation to the opening of the Save the Mary Museum and River Education Centre (next to Kandanga Railway Station) on Sunday 11 July at 11.30am with Wildlife Crusader, Bob Irwin as special Guest Speaker. The Museum will be a tribute to all the people who worked so hard to overturn the decision to dam the Mary River. Visitors are lead around the walls of the building by following a section of the rainbow scarf that was knitted by volunteers during the lengthy campaign (the entire scarf is hundreds of metres long). These walls become a story-board of the campaign from start to finish, packed full of colourful photos and signs, crammed with information. The museum also features a resource area focussed on river education. 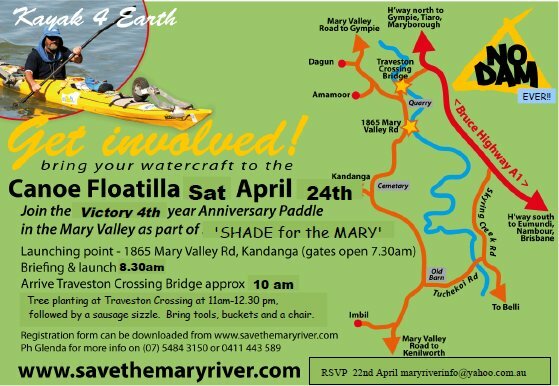 read more..
Download the attached invitation and registration forms for the 4th Anniversary Canoe Floatilla finishing with a Traveston Crossing tree planting on Saturday 24th April 2010. RSVP by Thurs 22nd April to maryriverinfo@yahoo.com.au.